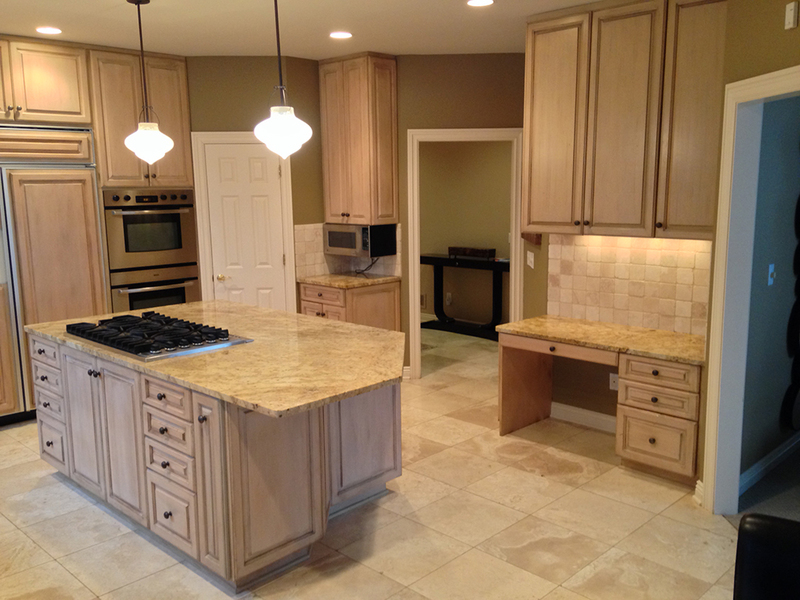 Kitchen Refinishing • Stairs • Entry Doors & More! 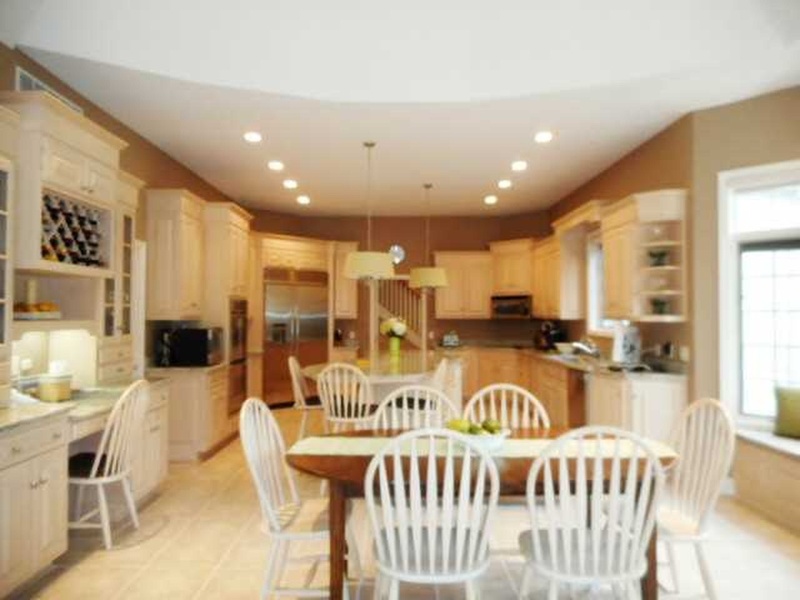 Thinking about painting your cabinets? We also offer a finish in pure white that is unlike any paint out there today. It`s unique in that it doesn`t need a primer for it to adhere. This material will stick to plastic laminate! It`s so durable that it doesn`t need a clear coat that will alter the color it covers, so pure white stays pure white. It`s also tintable to off whites or other colors. 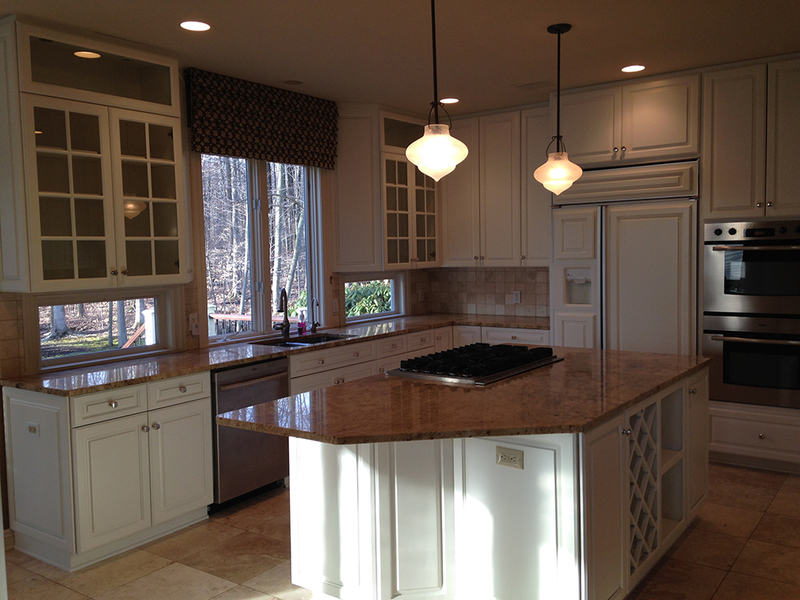 We mask off walls, counters, floors, etc. If you have a nice, solid stair railing in your home but are tired of the finish on it, why not have us give you a darker, richer tone, and have us change out the balusters(spindles) to the new generation of wrought iron that’s now available? 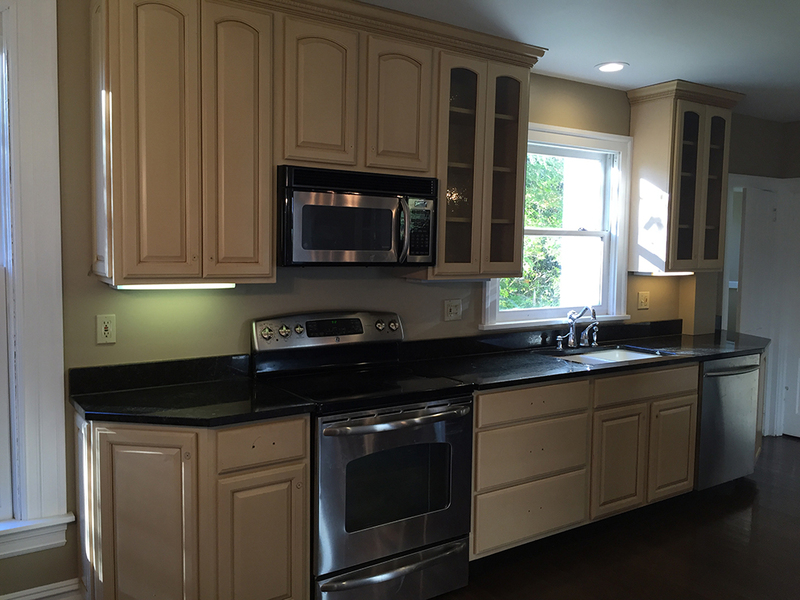 We`ve refinished hundreds of kitchens and stairs with this process, and year after year our clients continue to offer to be references......sometimes before we`re finished with the work! We'll let them tell you. 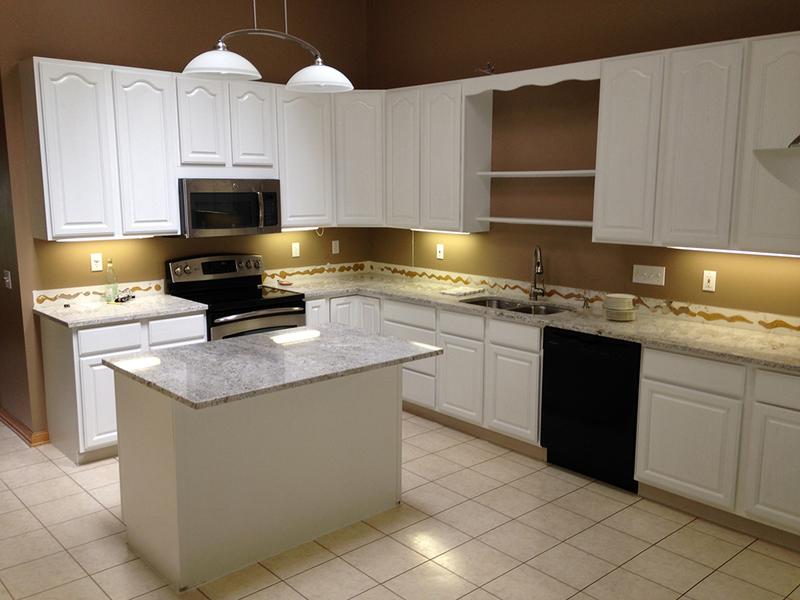 Enjoy the BEFORE and AFTER photos of our projects! Click on any photo to enlarge it and begin a slideshow. Within the show, hover on the picture for the Next and Previous buttons. Click the Close button to return to this page. 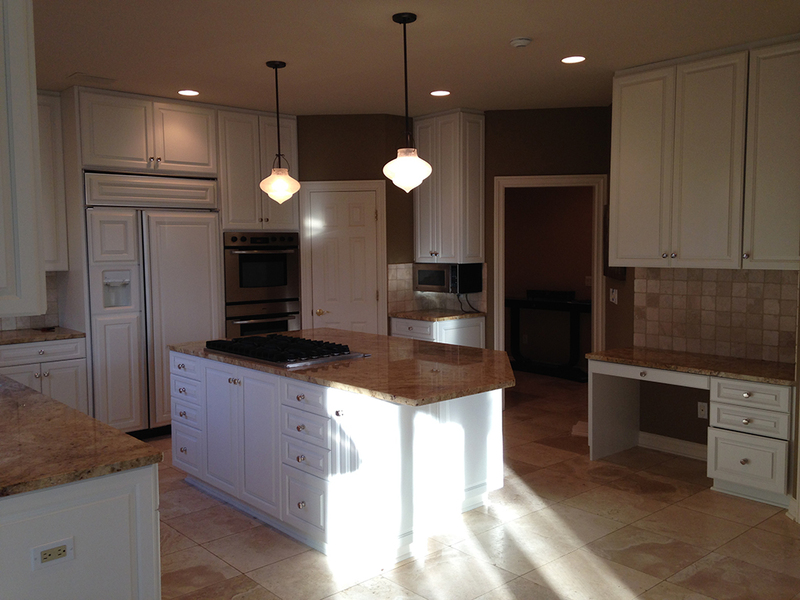 We take great care to avoid over spray by masking off the areas we are working in. In doing so, there are times when some paint may come off when removing masking even though painters tape is used. We take great care to avoid over spray by masking off the areas we are working in. In doing so, there are times when some paint may come off when removing masking even though painters tape is used. 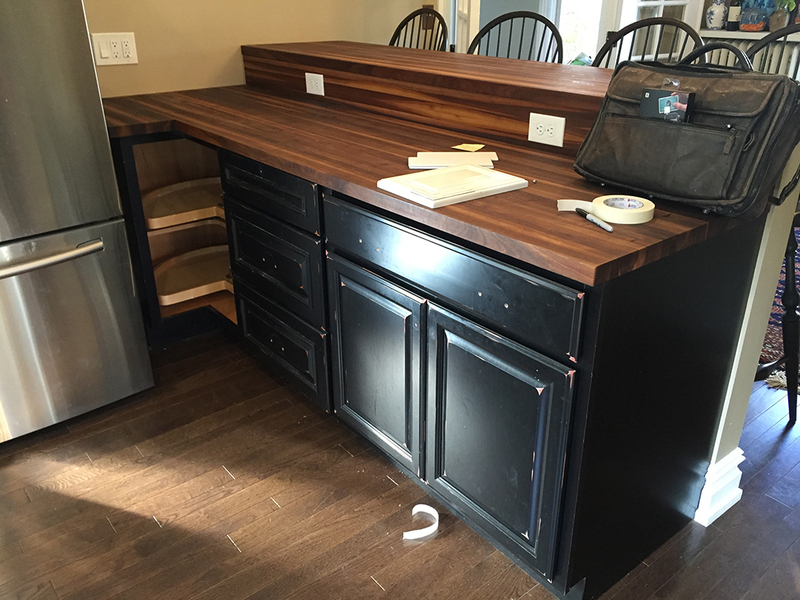 In such a case Architectural Woodworking Inc. is not responsible for touch up painting as this is most likely due to the surface being improperly prepped prior to painting resulting in paint lifting when painters tape is applied. 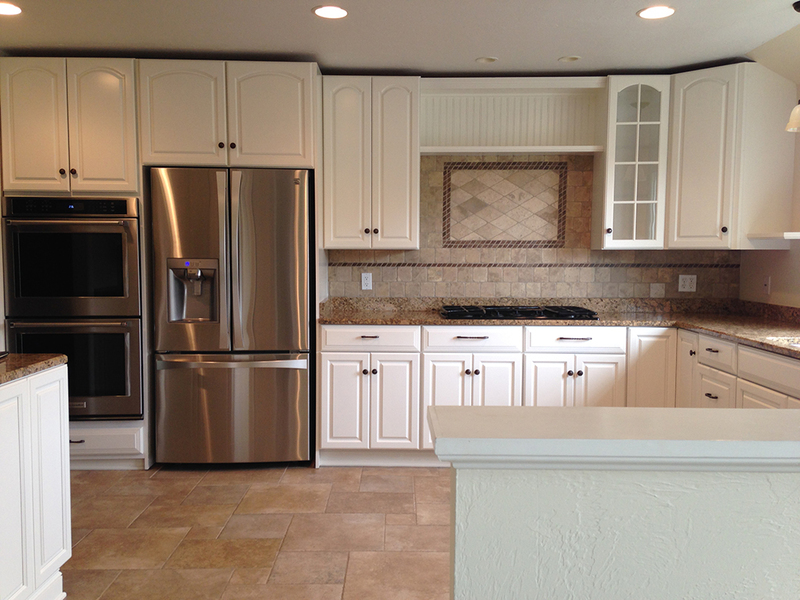 In the event of over spray, It is simply a matter of wiping down with a cleaner or solvent to remove. 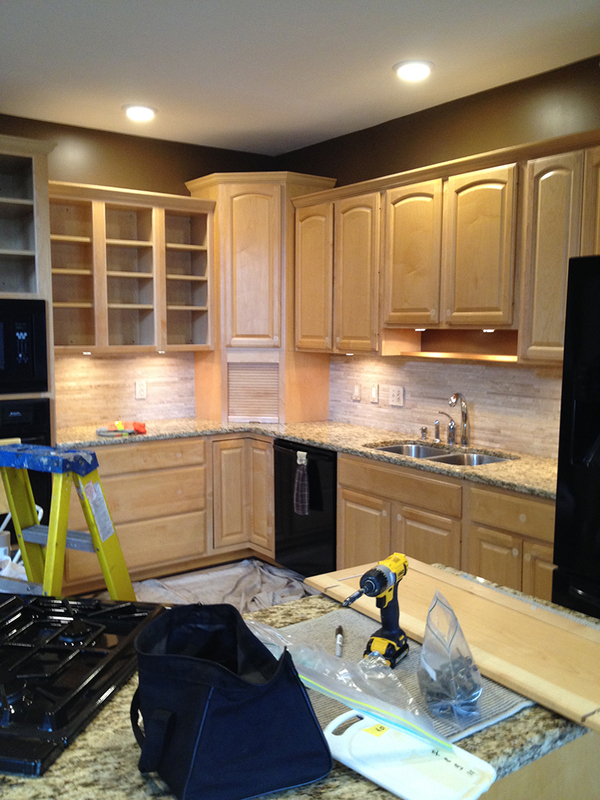 Architectural Woodworking will do this prior to job completion. If any over spray was overlooked and it's brought to our attention within five days, we will clean it at no charge. 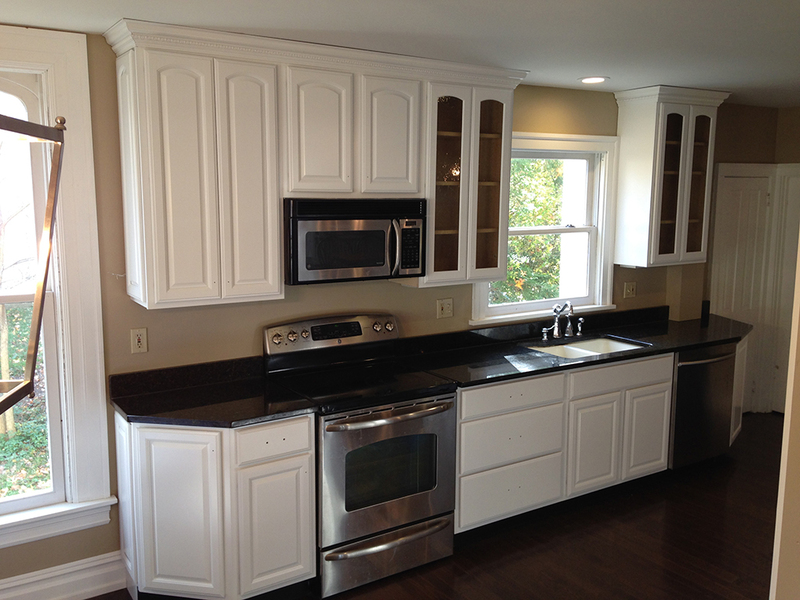 Architectural Woodworking is not responsible for touch up painting due to over spray as it is removable with our cleaner. 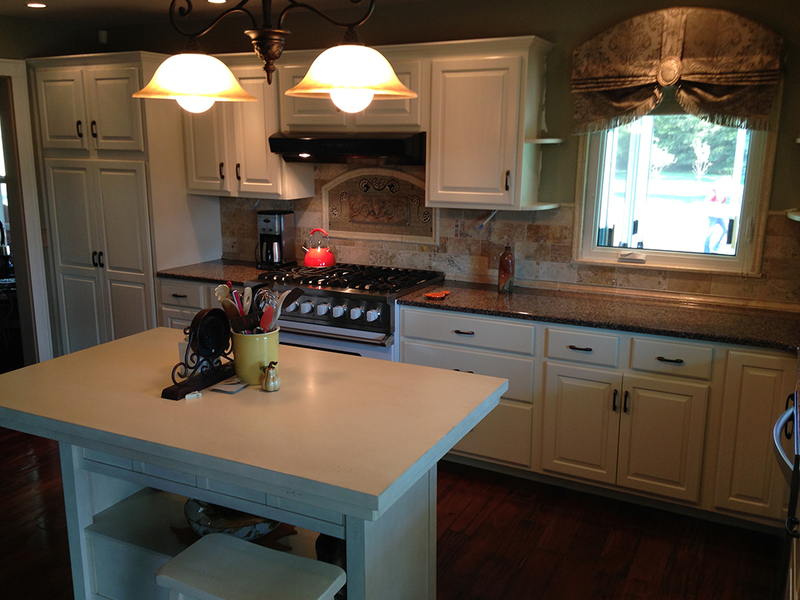 The Super Stain Process will provide you with years of wear if cared for properly. We recommend cleaning with Squeaky Clean made by basic coatings or wiping with a mild solution of dish washing detergent and water. The finish is most vulnerable in the first 10 days as the finish cures. Be especially careful with rings and fingernails (especially salon nails). 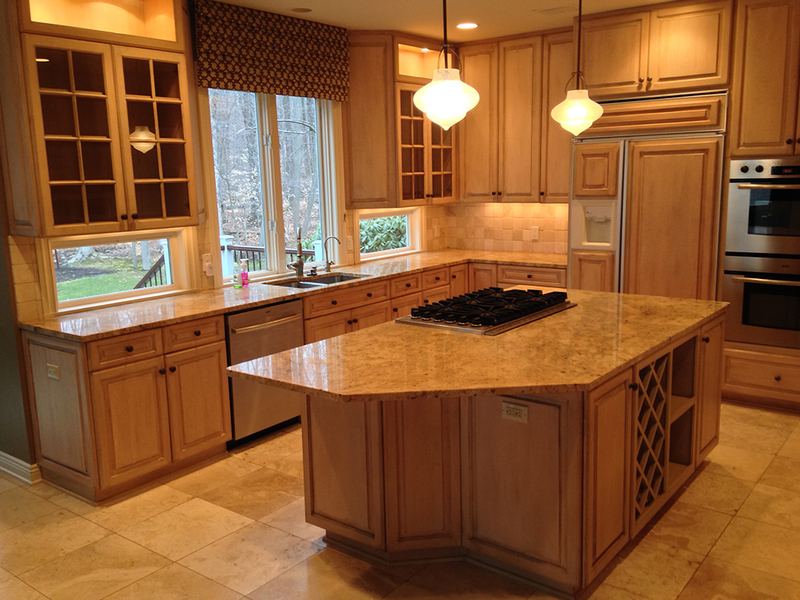 Please keep in mind that the Super Stain Process achieves it beautiful results as a finish that coats an existing finish. As with any coating it can be scratched with a sharp object. 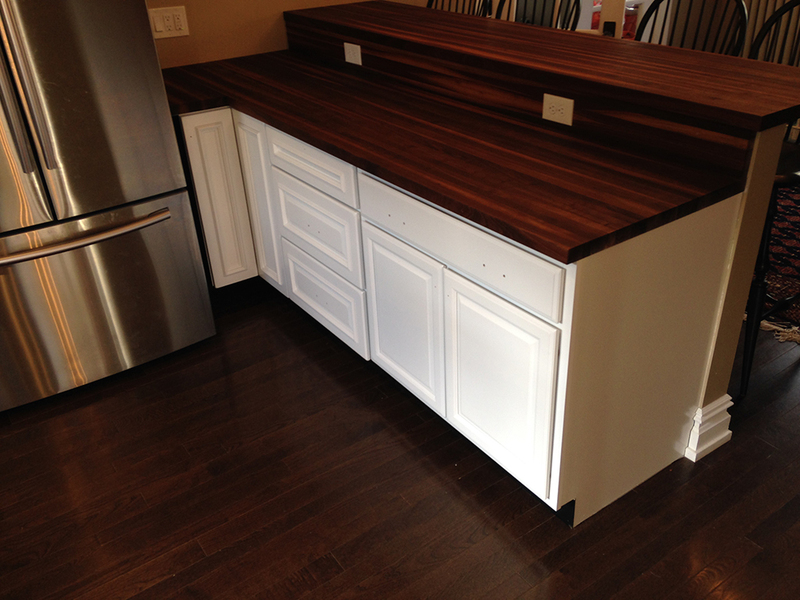 If this should occur, a furniture touch-up pen is all that is needed to fill in where the color may be missing. 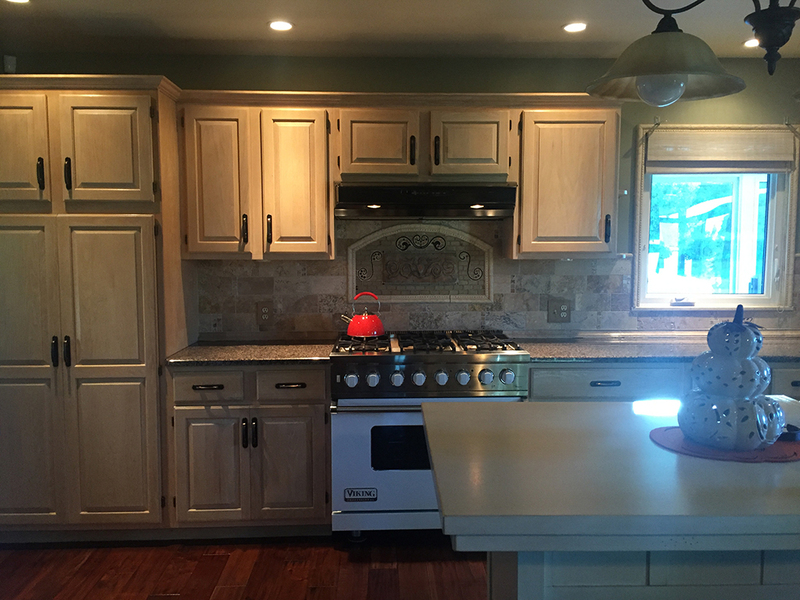 My husband and I are very pleased with the work of Architectural Woodworking Inc. Dave and Dottie were pleasant and easy to work with, accommodating our tight schedule and completing the work in our kitchen exactly as they had described. 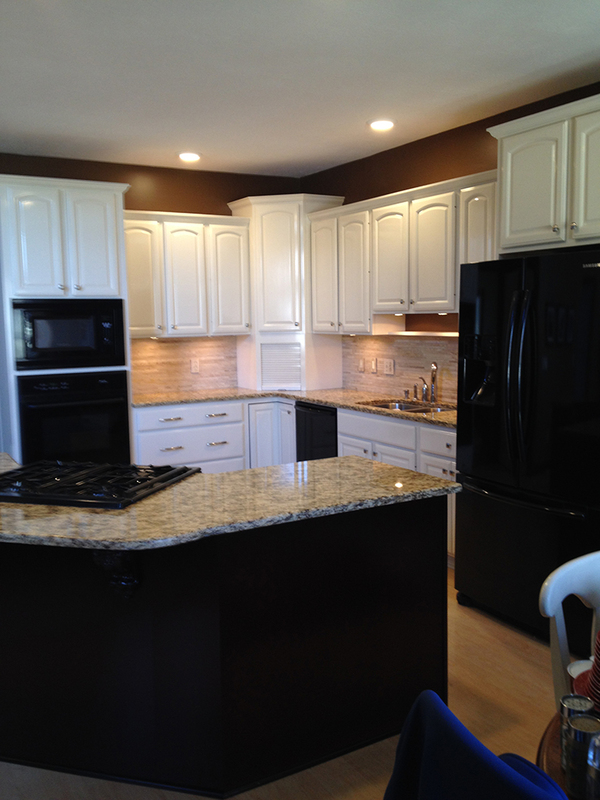 They took our 12-year-old builder grade oak cabinets and made them look new. The work was so well done that two separate contractors provided unsolicited positive feedback about them. 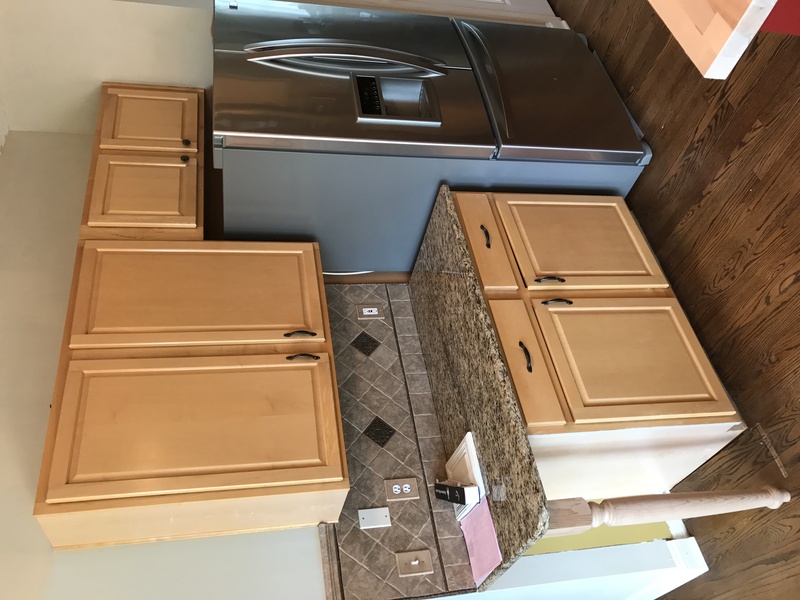 One general contractor with almost 40 years experience was very impressed with the work and the contractors who installed our granite counter tops complimented our "new" cabinets. 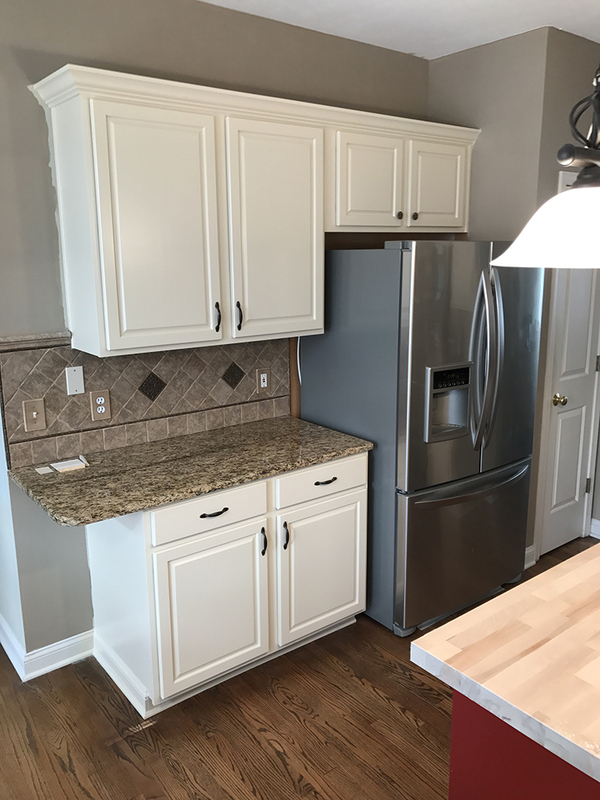 When I told them the cabinets weren't new, they were refinished, they said they had never seen such quality work on a refinishing job. 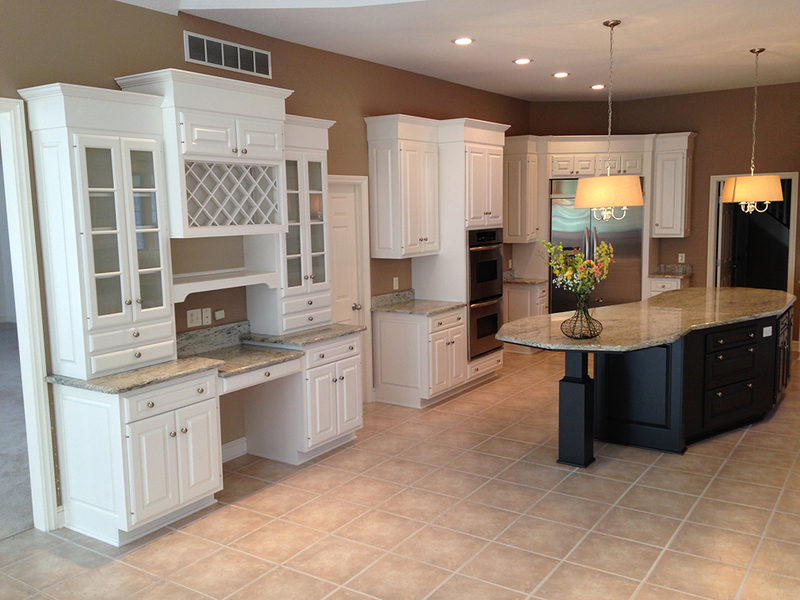 If you are looking to breathe new life into your kitchen or other cabinetry, I'd highly recommend contacting Architectural Woodworking Inc. 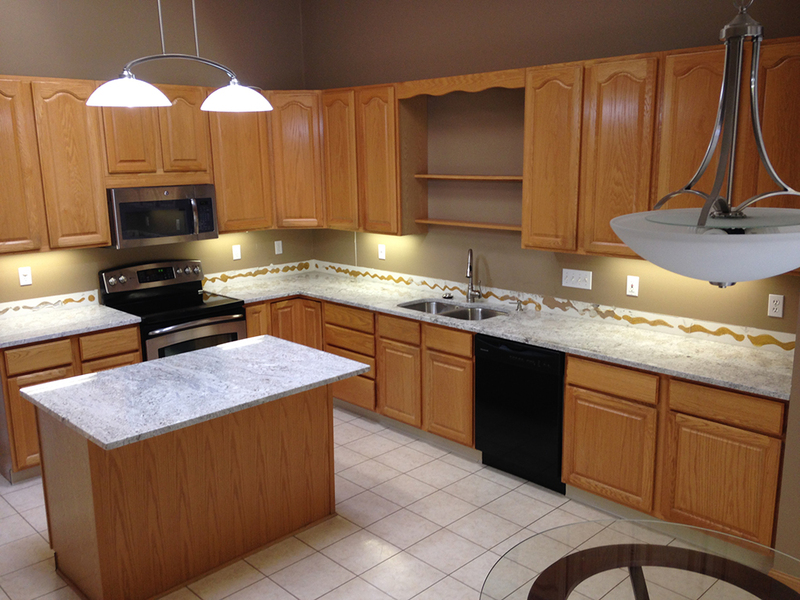 Call today to find out more about our process for making your wood surfaces look brand new again. All photos used on this website are photos of actual work performed by us, and not stock photography.